The human brain contains two major cell populations: neurons and glia. While neurons can propagate electrical signals, known as action potentials, glial cells remain electrically unexcitable. For this reason, for many years, they were thought to merely serve as structural support for neurons, like the scaffolding of a complex building. Nonetheless, over the past decade, astrocytes, the most abundant subtype of glia, have been the focus of much research because (1) they are part of what is known as the tripartite synapse, specialized structures that connect different neurons via electrochemical signals, which allows them to modulate neuronal communication; (2) they regulate neuronal excitability and brain balance through uptake of molecules released by neurons and active control of the levels of extracellular K+ found in the cerebral fluid surrounding all cells in the brain; and (3) they are coupled via small channels named gap junctions, thereby forming extensive networks that reach distal brain areas. Fig. 1. Astrocytic modulation of brain waves. 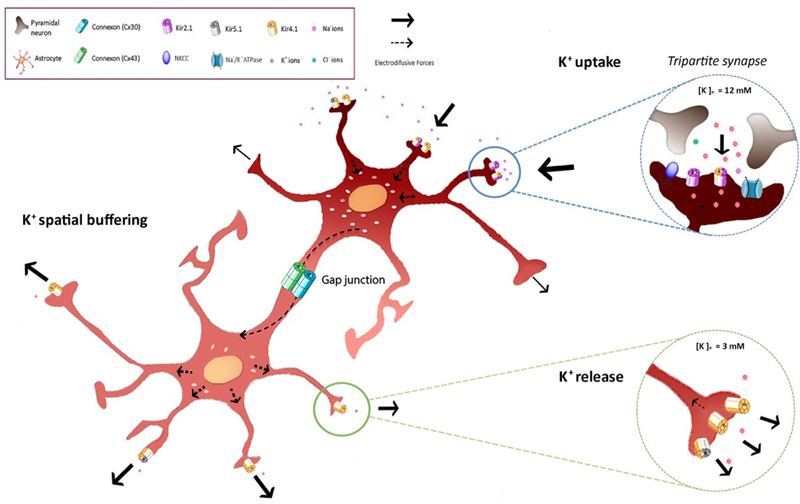 Schematic diagram describing the three mechanisms taking place during astrocytic K+ clearance following increased extracellular K+ ([K+]o). K+ uptake – Neuronal firing leads to local increase of the [K+]o (∼12 mM), which is temporarily sequestered by astrocytes via the astrocytic Na+-K++-ATPase (NKA) pump assisted by the Na+-K+-2Cl– cotransporter (NKCC), leading to decreased [K+]o. K+ spatial buffering – Elevations of [K+]o above its physiological levels (>15 mM) lead to transference of K+ ions through astrocytic Kir4.1 and gap junction channels from areas where K+ is high to distal regions with lower [K+]o. K+ release – Eventually, this K+ increase promotes a distal outward current to the extracellular space, where K+ is low (∼3 mM). Arrows indicate the direction of K+ driving force. At the network level, individual neurons synchronize their activity with each other, giving rise to rhythmic voltage fluctuations travelling across different brain regions, known as network oscillations or brain waves. These rhythmic oscillations are viewed as the critical link between single-neuron activity and behaviour. They range from very slow to fast fluctuations and are classified by power and frequency bands, with different frequency bands being associated with specific behaviours (e.g. sleep, learning, attention). Hence, regulating brain waves is a key role for all live species, essential for our survival. Among the mechanisms impacting on the generation of neuronal oscillations, changes in the extracellular concentration of K+ have been previously reported to affect brain waves. Indeed, concentrations of extracellular K+ above its physiological levels likely lead to hyperexcitability and pathological conditions, such as epilepsy. Astrocytes closely monitor and maintain the proper levels of extracellular K+ (normal physiological range is 3-12 mM) through a process called K+ clearance. This astrocytic mechanism includes net K+ uptake, which occurs following small increases in extracellular K+, a byproduct of neuronal activity, and K+ spatial buffering, which involves the transfer of K+ from areas with high K+ to distal regions with lower K+ concentrations through gap junction connections, as illustrated in Figure 1. To modulate K+ clearance, astrocytes can either decrease the K+ flow from the extracellular milieu, by reducing the number of opened K+ channels, or alternatively close the channels they form with other astrocytes and thus block the transfer of K+ ions to distal regions. Either way, local K+ levels will be higher than normal and will affect neuronal activity within the vicinity of the astrocyte. In our manuscript (Bellot-Saez et al., 2017), we have proposed that the strategic location of astrocytes as part of the tripartite synapse in one hand and an efficient regulator of neural excitability on the other, allows them to modulate brain waves by adjusting the levels of extracellular K+. Hence, today it is clear that astrocytes not only provide the scaffold where neurons grow and mature, but also are the actual safeguards of the entire network activity. By adjusting K+ clearance mechanisms to impact neuronal activity, astrocytes also have the ability to mediate the transitions between brain waves oscillating at different frequencies, and thus our own behavior. Astrocytic modulation of neuronal excitability through K+ spatial buffering.